UK equities have enjoyed a strong rally since the Brexit vote. With uncertainty ahead, do they have further to run? James Illsley, fund manager on the JPM UK Equity Core Fund, looks at the factors—short-term and long—that mean UK equities are still a vital part of investors’ portfolios, and explains how J.P. Morgan Asset Management looks past the near-term noise to identify long-term potential at the stock level. UK equities have delivered strong performance for investors in recent months. But valuations do not look stretched. In fact, the cyclically adjusted price/earnings ratio for [the FTSE All Share] is still almost 20% below its long-term average. Valuations also look attractive relative to bonds, with the UK equity market offering a 4% yield—little changed from back in 1990, when Gilts were yielding 10-12% (Source 1). Earnings estimate revisions are strong around the globe, and this is mirrored in the Citi Economic Surprise Indicators, which show that global economies—including the UK—are exceeding expectations. As economic growth picks up, so too are inflation expectations—and equities remain the best way to protect against inflation. From an asset allocation perspective, investors appear to continue to favour underweight UK equities—so there seems to be more upside opportunity to current positioning than downside risk. Finally, we continue to see corporate activity in the UK, with high levels of Mergers and Acquisitions (M&A) as corporate buyers take advantage of the opportunities afforded by quality companies and a cheap currency. Over the last 12 months there has been GBP 77 billion of M&A activity in the UK/globally, according to Bloomberg (Source 2), and that has not stopped with Brexit. As investors have been reminded since the Brexit vote, UK equities are not a UK play, but a play on global growth, with 70% of revenues sourced overseas (Source 3). The global economy is forecast to grow 3.34% this year—and combining that with inflation of 3% gives us an estimate of 6% growth in sales (Source 4). Sterling weakness has boosted UK earnings and improved the terms of trade for many UK companies supplying goods and services around the world, as reflected in unexpectedly strong manufacturing data. Most importantly, over the long haul, equities have outperformed other asset classes. The Credit Suisse Global Investment Returns Yearbook 2017has perhaps the best asset class return data, over the longest period. For many countries, the data stretches back to 1900, encompassing huge technological change, two world wars, the Cold War and any number of financial crises. The key takeaway from the Credit Suisse Global Investment Returns Yearbook 2017 is this: in every one of the 21 of the countries covered, equities beat bonds and cash delivered a positive real return. In the UK specifically, the long-term real return to equities is 5.5% per annum since 1900. This compares to 1.8% for bonds and 1.0% for cash. Over 40 years, at these rates, £120,000 invested in cash would be worth just under £180,000 in real terms. In bonds, £120,000 invested for 40 years would give you less than £250,000. The same amount invested in UK equities would be worth just over a million pounds in real terms 40 years later, at these rates of return. That’s why UK equities seem to make sense for long-term savings needs (Source 5). While the long term case for UK equities remains unchanged, in the near term, the environment is certainly going to be interesting for investors, with plenty of uncertainty both at home and abroad. We believe our investment process, which looks through short-term noise to the characteristics that drive long-term performance at the stock level, is well placed to help. We do not take large macroeconomic bets, but instead maintain a disciplined focus on company fundamentals: Is the stock cheap? Has it got positive momentum? Is it run by a quality management team? This is an investment process that has worked for us for the last 20 years, in changing economic and political landscapes, and we are confident it will help us and our clients to find opportunity in the current uncertainty. 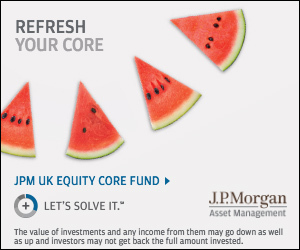 For investors who are worried about taking on too much risk while the outlook is hazy, our JPM UK Equity Core Fund offers a low cost, low active risk way to access our active management capabilities. For those looking to exploit the uncertainty and benefit from companies that are struggling to adapt to the new environment, as well as those with the potential to thrive, our JPM UK Equity Plus Fund, with its ability to take short positions in unattractive stocks, may be an appealing option. Whichever fund investors choose, we believe the attractively valued UK equity market will continue to reward long-term investors who focus on the fundamentals.